This extremely faint planetary (mag 16.6, dia. 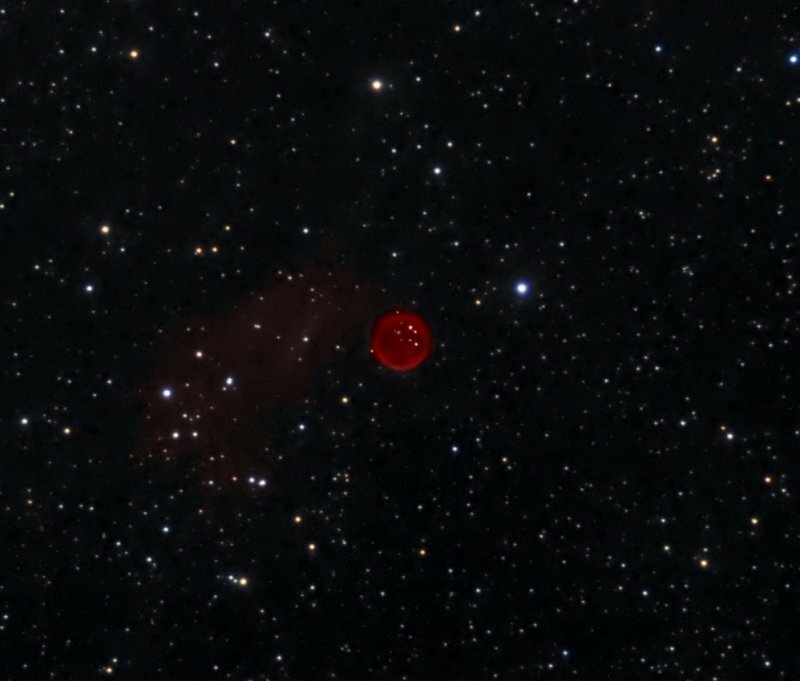 60”) is mostly Ha, so I used Ha colorized to pure red for the nebula and the faint wisp of nebulosity near it. A few hours of OIII was also taken, but it was just a faint version of the Ha and so was not used. Optics/Mount: CPC1100 with f6.3 Celestron reducer on a Milburn Wedge. Dec antibacklash set to 27/27. PEC on. Exposure: Total exposure time about 8.75 hours; 24 x 20 mins Ha, plus 14 x 1 min each RGB. All bin 1x1. Guiding Hardware: ASI120MM, Celestron off axis guider. Guiding scale 0.92 arcsec/pixel. 1 second guide exposures. Guiding Software: PHD2. RA aggressiveness 55, hysteresis 0, Minimum Move 1.4 arcsecs, Max RA 1000, Max Dec 600. Guiding unbinned with ZWO connection. Dec set to hysteresis. Dithering set to Extreme with Settle < 1.2. Guiding performance: FWHM of subs about 1.8 arc seconds, RMS in PHD about 0.75 arcsecs. Processing: Bias, darks, and flats. Stacked and processed with PixInsight, with a few minor modifications in Photoshop. The nebula is Ha, colorized to pure red, and layered onto the star field in Photoshop.